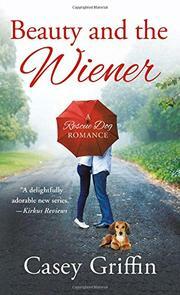 A stylist and a bartender have to work together to discover who keeps kidnapping show dogs and letting them take the blame for it in this second novel by Griffin (Must Love Wieners, 2016). Dog stylist Addison Turner wants to be the Coco Chanel of the four-legged world and has done the Shih Tzu shiatsus to prove it. With her new grooming and fashion business rising, she has everything going for her—but she’s still looking for Mr. Perfect. Then dogs start to go missing in her care, and she just wants to find them before she gets sued or arrested. When bartender Felix Vaughn gets accused of being her partner in crime, the two must work together to find the culprits, since the police are too busy looking for a serial killer (who is never mentioned again). The two have trouble keeping their hands off each other, but Addison has plans when it comes to love, and a lowly bartender isn’t part of those plans. Both main characters take a while to warm to as they learn more about each other and themselves, and their romance, while cute, seems only to be there as a lesson not to make assumptions about other people. In the end, regardless of the lackluster story, Griffin still compels readers with a snappy writing style that doesn’t completely telescope the mystery from the first page. A good follow-up that has less fun than the first in the series but just as much heart.